. . . observations : Is there life on Mars? Is there life on Mars? You betcha. I have the photo to prove it. Their highway system is complex that it surpasses even the best freeways in SoCal. They even have a Holiday Inn close to the freeway - very convenient for tired transients who have been on the road for so long. Wait a minute? Isn't that the 60 Freeway? Heh. 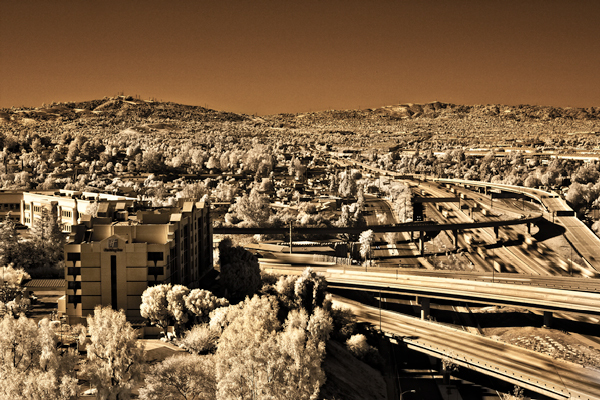 I shot this test image yesterday at high noon to see how my converted Infrared (IR) camera would perform. What you see here is what came out of the camera unprocessed except for some contrast tweaking. The colors are the result of the IR camera. My crappy Canon EOS 350d was crapping out so I converted it to shoot IR exclusively. Basically, the digital sensor on all DLSR have a filter to block the IR light so the colors of the pictures come out looking normal. Remove the filter and it will let the IR in - which produces surreal colors. It would be difficult to do this in Photoshop. I didn't do the conversion myself as I would have probably killed the camera. There are places where you can take your camera and they'll gladly do it for a fee. Hope you enjoy. Have a great day.